Every once in a while a nice surprise comes along. I was contacted by Lance at Virtual Clothes Horse to see if I would be interested in a garment he had. 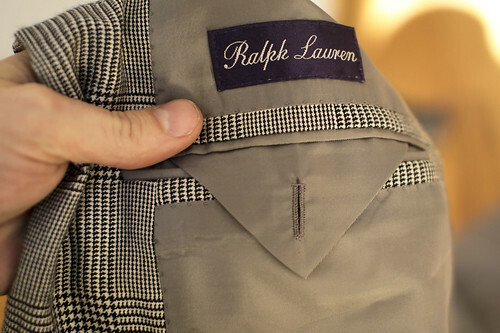 A Ralph Lauren Purple Label sportcoat made by Raffaele Caruso, which, by itself, was intriguing. What was most interesting was that this one was recent, new, and had all its tags. Usually I have no idea of the age of a garment, and more often than not, it’s pretty old and not reflective of current workmanship. In this case, it’s safe to say that it’s pretty current. It was a MTM garment that was unclaimed by the customer and whose size was such that Lance felt he would have a hard time moving it so he ended up donating it to us. Thanks Lance! Before we start cutting, a reality check. 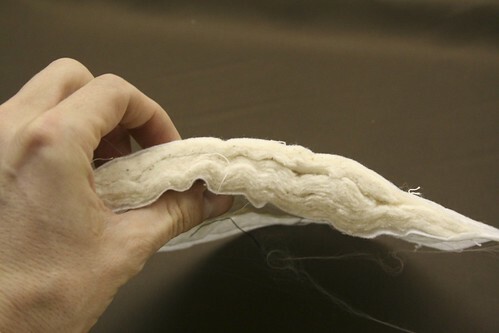 The garment is made of cashmere and silk, a blend that is normally so flimsy and unstable that it’s a real headache to sew. But this is a fantastic 2x2 construction that is robust and shows no sign of the distortion in the grain or any of the seam slippage that is so typical of this blend. Certainly a contributing factor in the price. Readers are, by now, aware of my buttonhole fetish and so will not be surprised to know that one of the things I most eagerly anticipated were what promised to be sensationally hand-made buttonholes. To my only partial dismay, there were none. Not one. Which actually makes a lot of sense. Not only are the sleeves basted in preparation for final adjustments before cutting the buttonholes, but the omission on the front and lapel leaves the possibility of making certain adjustments to the fit of the front which would have been impossible had the buttonholes been cut. Whether this was a special request by a very particular salesperson or client, or whether this is the usual practice for Purple Label MTM service is unclear, but at almost $5,000 one has every right to expect a properly-fitting garment so every precaution should be taken. 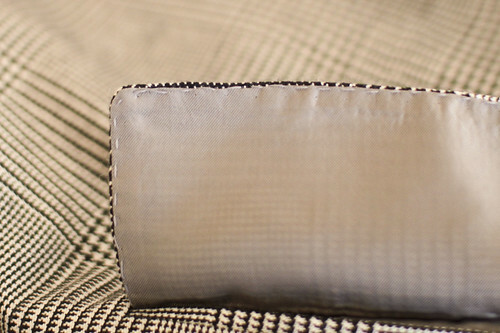 Inside the pocket we find this attractive pouch holding the buttons and, of course, a spool of silk buttonhole twist. The twist is Seta Bozzolo Reale by Cucirini Tre Stelle which I mentioned in previous posts. It is distributed in the U.S. by Gilbreath Threads, who can be contacted at 800-247-2396 or by clicking here. Ok, so I lied. There was one buttonhole. 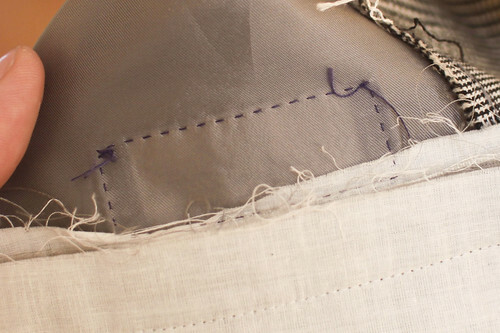 The envelope flap on the inside pocket had a buttonhole embroidered by hand. Along the facing edge we see some pick stitching. 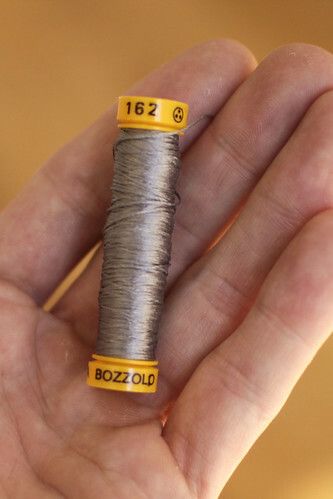 I often see ebay descriptions of garments referencing “tons of handwork”, usually describing this stitching, among other things. 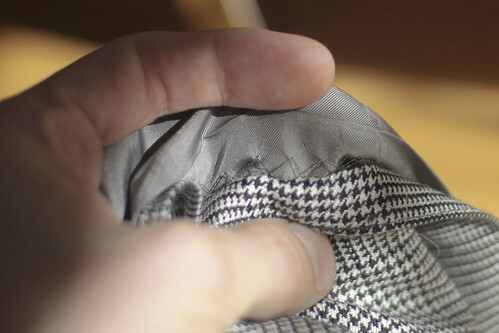 Because the underside is unattractive, it’s usually used only on parts whose wrong side will be concealed, like the facing, and sometimes the trouser pockets and fly. Never on the coat edges. Before anyone gets their knickers in a twist over “deceptive practices”, even the Kiton garments I examined had used this exact type of machine stitch. The other type of machine is made by Conti Complett. 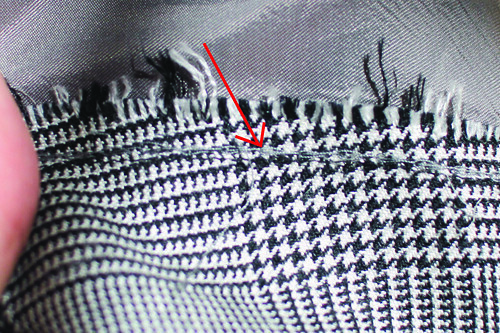 The underside of this stitch, unlike the other type of machine, is neat and resembles the hand stitch it is meant to duplicate. The downside of this machine is that it is slow and very expensive. The label was stitched on using a Complett machine; notice how very uniform the stitching is on the underside- only a machine will be this precise. Now have a look at the underside of the flap- nothing at all like the label, so it is most likely that the edge stitching was actually done by hand. Very few RTW makers do this by hand anymore because the machine generally does a good job. However the bottoms have been finished by machine, a step some makers at this level still do by hand. The front canvas is very generous, and rather than using haircloth in the chest, a very good quality wrapped hair has been substituted. This is similar to what we saw in the Saint Andrews garment and gives a softer feel to the chest. Notice how the edges of the chest piece are taped to prevent the hair from poking through. What is somewhat surprising is the size of the pad- this is the thickest pad I have seen in RTW for a long time. Mr. Lauren is known to appreciate a more imposing shoulder than some of his American colleagues. 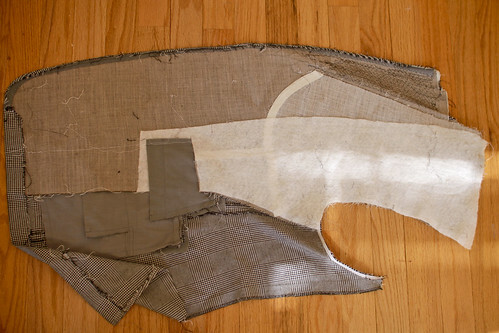 In fact, the entire collar has been constructed and attached by hand, including the gorge. Very nice. Portions of the edge tape have been felled by hand. There was something about the edges of the coat that caught my attention but I couldn’t quite put my finger on it. Upon (much) closer inspection I found that the entire facing had been drawn on by hand. 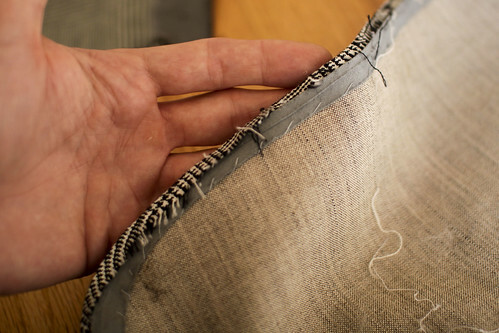 In other words, where most (including most bespoke tailors) would join the facing to the coat along the front edge by machine, this facing has been carefully basted in place, wrong side to wrong side, with the edges turned under and then slip-stitched by hand all along the edges, and they have done a magnificent job of it. The Brioni dinner jacket is the only other RTW garment I have seen which featured this technique, and only few bespoke pieces were done this way. I was intrigued so I made a few inquiries. Paul Farrington, the technical designer at Hickey Freeman, visited the Caruso factory recently. Paul spent his early years at Chester Barrie, including a stint at D’Avenza. He told me that the system used at Caruso was brought first from Chester Barrie to Saint Andrews in the late sixties, and then to Caruso by a technician named Frank Vita. 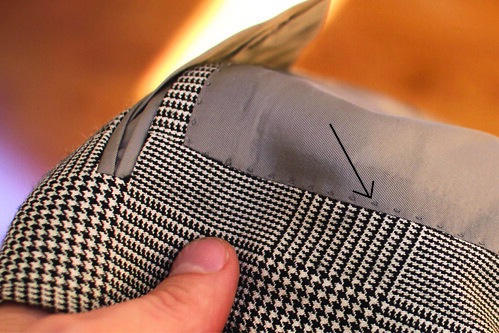 To augment the old-school tailoring is a decidedly new-school tech system which has bar-code driven PCs at every station so operators can reference specs, components, and sewing instructions. This kind of system allows for minute adjustments and customization the likes of which most of us in the trade can only dream. Paul did say that the regular production gets machine-sewn facings- only certain garments are done by hand, which makes sense since I am not aware of their house label selling for such astronomical prices. This garment definitely ranks up there with some of the best of the recent ready-made garments I have examined- I’m going to have to try to get my hands on a trouser to see how those are made as they promise to be just as interesting as this coat. thank you mr d, this is a wonderful insight into a newer garment, as you said. much appreciated as always. 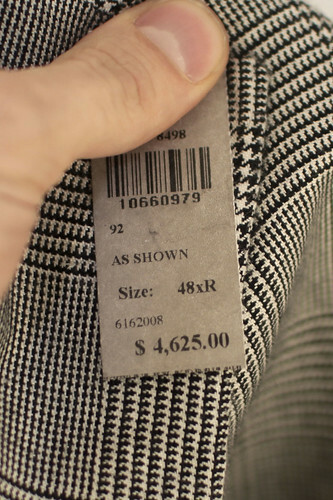 any chance you have a photo of the whole coat before you took it apart? Thanks a lot for the walk-through. :-) Very interesting, as always. In practical terms, what does the $5000 purple label made by Caruso do better than the $2000 black label made by Caruso? Is it functionally any better or is much of the difference simply handstitching vs machine stitching, different canvass, etc.? I love Ralph Lauren anyway, but this just makes me like him even more. can you explain more about the old school vent finishing how does this differ from newer methods. That vent is intriguing, is there any place that has a line drawing or sequence of photos to try to reproduce it? Thank you for your insightful analysis. I love to take my husband's old suits apart. I regret sending a Ralph Lauren linen suit from 1979 to the Salvation army. Ralph Lauren handles their jackets up to 95% on technology Brioni. Ventilation slits in jackets Brioni performed in the same way. 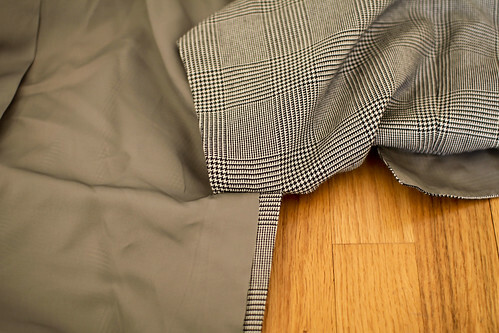 Brioni has a little more interesting (with cunning) is processed inside pocket. Beautiful coat and great post. Thanks for taking the time Jeffery. 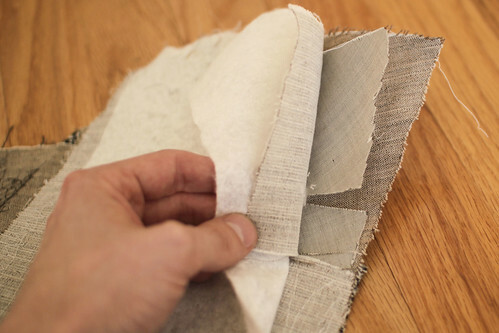 Have you ever taken apart an RLBL coat? I didn't see anything in the archive. 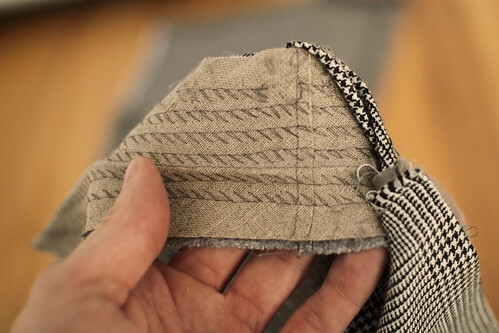 Supposedly they feature hand pickstitching, but it looks so incredibly uniform that I find it difficult to believe. It more closely resembles the Complett stitch above. 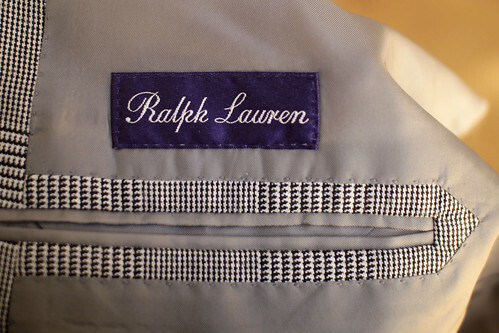 can never get over the aspirational qualities of ralph lauren, from his name change and tie-salesman days. the best thing about him is that his bid to acquire Anderson & Sheppard was turned down. The article is titled "Tailoring Principles", everyone, and our resident expert tailor is the author! GRP712- I haven't examined a RLPL but aside from the cloth, which will add a lot to the price, I would imagine that most of what is done by hand on the PL is done by machine on BL. Whether or not that makes it any better is up to the consumer to decide. brendan- I wouldn't want to commit to an absolute value (generally between 9 and 11 inches for a regular)- it should be a matter of proportion and taste. They usually sit about two thirds of the way down the coat, often level with the top of the vents. It's nice to finally see an article pay tribute to the master behind this exceptional craftsmanship...Frank Vita. His work is second to none in the industry and is considered the best tailor in the world, you would be surprised the patterns and designs he has created. 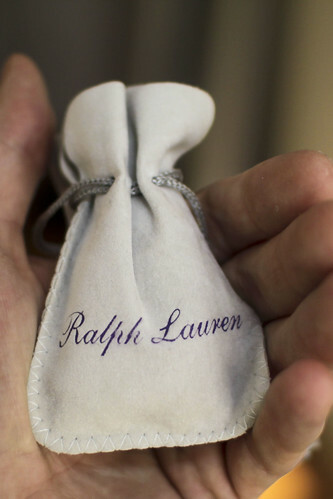 I know this is going to sound like a strange question, but can you tell me what material the pictured Ralph Lauren pouch is? Thanks. I've made some pouches out of the same material it seems! FIRST RATE analysis !! Great job !! This is the kind of article I like reading about clothes. Very informative. Meh. Not deserving of the price tag. Machine stitching to look like hand work and shoddy handwork is not acceptable. Very underwhelming. Frank Vita is the man who is responsible for much of the design/construction of RL’s Purple and Black label lines. An old school craftsman who’s talent is second to none. He is a personal friend of my family’s.